Space is priceless is big cities, especially in London. If you are fortunate not to have what I call a dorm fridge in your flat then hosting a Thanksgiving dinner for fellow expats is doable. You just have to make it work. Our fridge isn’t a dorm fridge but it ain’t a big ‘ole American sized one either. Here’s to making it work and finally hosting a dinner party. Happy Thanksgiving! 25 Nov	This entry was published on 25/11/2010 at 11:37 AM. It’s filed under London and tagged cooking, food, Thanksgiving. Bookmark the permalink. Follow any comments here with the RSS feed for this post. Ha, that’s awesome! Hope you had a great thanksgiving! 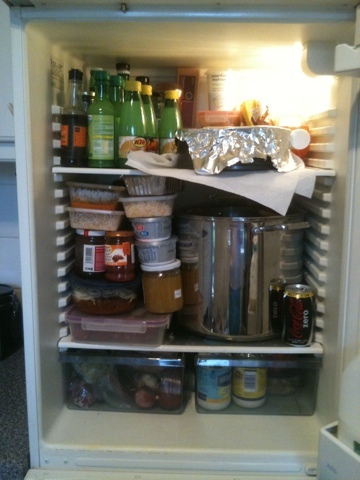 That’s what both of Joe’s parents fridges looked like…you are a saint!